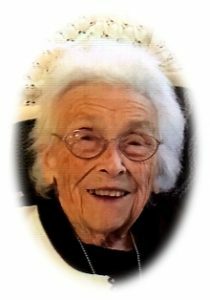 Armina K. Wach, age 94, of Park Ave., Waubeka (Fredonia), WI passed away Monday December 18, 2017 at the Lawlis Family Hospice in Mequon. She had most recently resided at the Harbor Club in Port Washington. She was born on August 16, 1923; daughter of Edgar and Anna Schellinger Bonlender in St. Killian, WI. Armina grew up in Nenno, WI; marrying Aloysius Wach of Fredonia at Sts. Peter and Paul Church in Nenno on September 16, 1944. Soon after they got married they moved to Waubeka. While raising her four children, Armina worked at the West Bend Company. For almost 21 years she worked at the High Tran Company in Waubeka. Armina retired in 1983. Armina is survived by her daughter Carol Wach of Eden Prairie, MN; 5 grandchildren Jennifer (Brian) Schurrer, Katie Wach, Joe Wach, Christopher (Melissa) Wach, and Kelly (Chris) Gully; great-grandchildren Noah, Cadence, Jayden, Kolton, Karleigh, Kelsey and Lucy, sister-in-law Rosie Bonlender of Allenton, brother-in-law Earl Kleckner of Waubeka, daughters-in-law Darlene Wach of Germantown and Connie Wach of Fredonia; nieces, nephews, other relatives and friends. She is preceded in death by her husband Aloys on May 16, 1995, her three sons Roger, Jerry and James Wach, her two brothers Marvin and Lester and his wife Gloria Bonlender, grandchildren Stephanie, Sarah and Edward, brothers-in-law and sisters-in-law Edward and Agnes Wach, Clarence and Loretta Spies and Mary Jane Kleckner. A Mass of Christian Burial will be celebrated at 6PM Wednesday, December 20, 2017 at Divine Savior Parish-Holy Cross Church, 5332 County B, Holy Cross, Town of Belgium, WI. Reverend Todd Budde will be the celebrant. Visitation will take place from 4-6PM Wednesday Dec. 20 AT CHURCH prior to Mass. Interment St. Rose of Lima Catholic Cemetery, Fredonia. Previous Post: Schmit, Gene W.
Next Post: Rosso, Herbert A. To the family of Armina: I met Armina back in the 90’s when she would go with my mother, Inez Bartelt, to bingo, to casinos, on bus to “overnighters”, and their Sheepshead games!! She was a good friend to the crew: my mom, Minnie Ruth and several others. I am very sorry for your loss…. We are deeply saddened to hear about the passing of your Mother. Armina was such a wonderful person to us. We always enjoyed her stories and her past memories she told regarding her family & the Hartmann’s. Pris & Armina were best buds all their lives & had such pleasurable times together. They did everything together. We are unable to attend the funeral as we are in Florida. Remember anytime you are in our area, make sure you stop by. After the funeral when you have some time, give us a call. We would love to hear from you. Our Condolences to you & your Family. You were a tremendous neighbor and friend Armina. You made our days brighter so long ago.